Red Bird of Paradise is a member of the Pea Family. It takes the form of a large irregular shrub and grows to 15 feet in height and 6 feet in width. It has green leaves with 7 - 15 pairs of leaflets that grow on alternate sides of the stem to 14 inches in length. 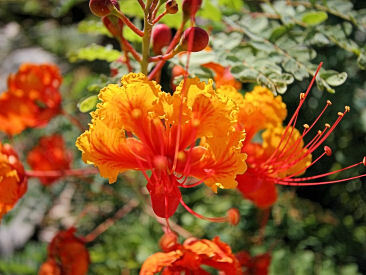 The plant is used in landscaping throughout Phoenix at elevations between sea level and 2500 feet. The Red Bird of Paradise is not native to Arizona, it originated in Central America, Northwestern South America, and the West Indies. The Red Bird of Paradise blooms between March - September forming bright red, orange and yellow flowers with long red stamens to 5" in length.